Craft supplies are one of my guilty pleasures. Most of the time it feels like I am collecting more than crafting, but luckily I am able to squeeze in a little time in my craft room from time to time. Today I got to do a quick trial run of what is going to be one of my new staples for ink blending: the Claritystamps stencil brushes. These things are ridiculously popular right now, and apparently they really do deserve their incredible reputation. Ink blending with sponges takes a good deal of practice before you have the right touch with it, and I know I’m still working on my own technique. These brushes have zero learning curve and achieve beautiful results with no experience required. I chose a basic stencil, picked out some fun colors, and went to town. The blending took about 10 minutes, with two passes of each color to get a little more saturation. Added a sentiment and some accents, and mounted the trimmed panel over a strip of black shimmer cardstock. Total project time: 20 minutes. Not bad at all for a first attempt! I can already pick out things I would have done differently, but that’s what experimentation is for after all. I can’t wait to play with some other color combinations and other blending techniques. These brushes made blending easy and enjoyable – and completely without the stress of accidentally ruining the panel at the end of the process and having to start over. I want to give a shout out to Tupelo Designs LLC for their amazing shipping. I ordered my brushes Monday afternoon at 3pm, and my order was in my hands Tuesday before 10am. The overnight shipping was free, and if you sign up for their free rewards program you get a $5 off coupon to use on your first order. I will definitely be shopping with them again! Final side note: the big 3-0 is in two days. My twenties were an amazing decade, and I’m excited to see where my so Call life takes me in the next one and beyond. One of my favorite things about my old job at the hospital was spending Tuesdays working in the Ambulatory Oncology Center. I made some amazing friends there, and we share a lot in common, especially our crafty hobbies. Since we only saw each other once a week, we had to cram a lot sharing into that one day. Thus began Show and Tell Tuesdays. Aside from the people, those days are what I miss most about that job. We still talk, we’ve even taken cake and cookie decorating classes together, but I still wish I had those Tuesdays to share our fun new things for the week. It’s easy to want to share with people you know. It’s a lot more intimidating to share with the rest of the world. I enjoy making all sorts of crafty things, and love giving handmade cards, but there’s still a level of self-consciousness about it that has kept me from starting a blog sooner. 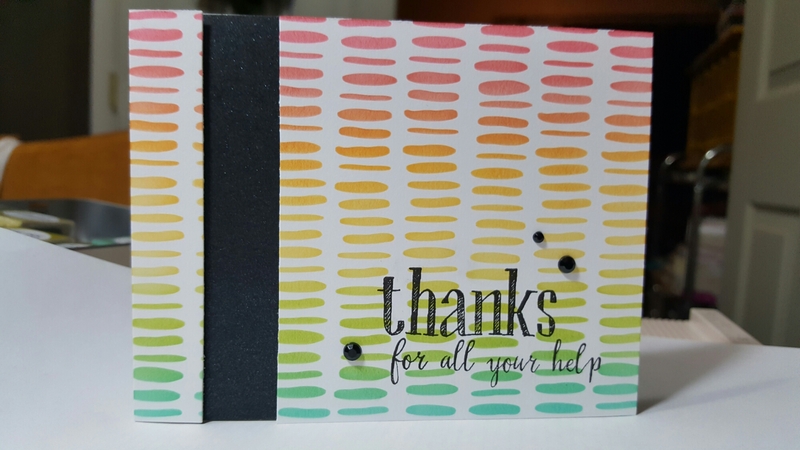 Now that I’ve gotten a whole two posts under my belt, here is my first crafty themed post with a card made today, for my first blogged Show and Tell Tuesday! Papertrey Ink had their annual Stamp-a-Faire this past weekend, and I was only able to follow along online since we were out of town. It was exciting to play in my craft room with the first technique of the day, Starry Night by Amy Sheffer. 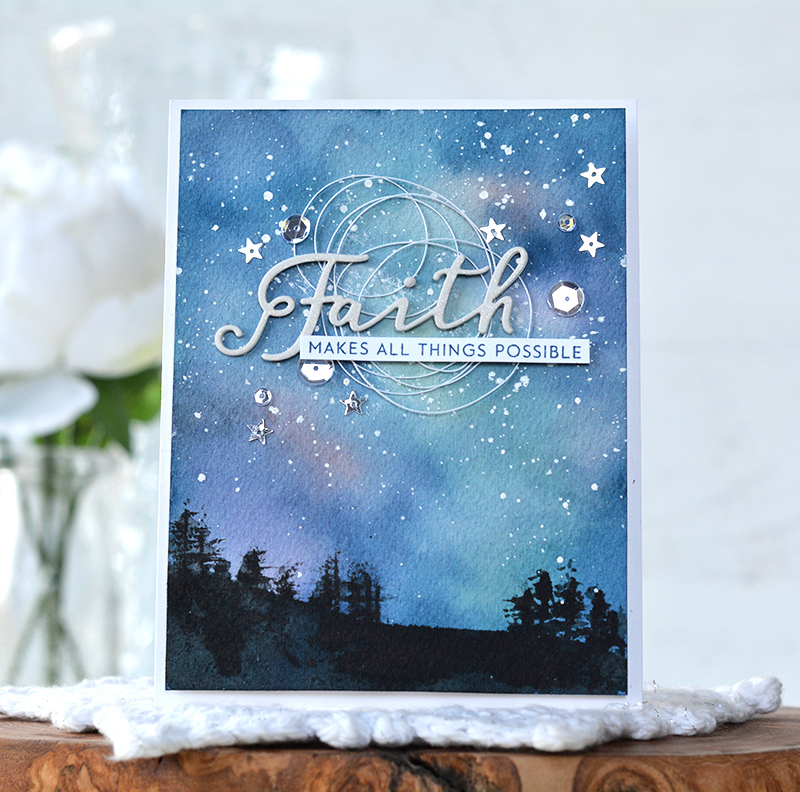 Her card was beautiful, and I’ve always wanted to try watercolor on a card. I know it’s a complete copy of her card, but for my first attempt I just wanted to see if I could come close to what it was supposed to like it. With the exception of the star sequins and thread, all of my supplies were the same. I think it turned out pretty well! There are a few spots at the top where the watercolor didn’t quite match, but I’m still satisfied with it. 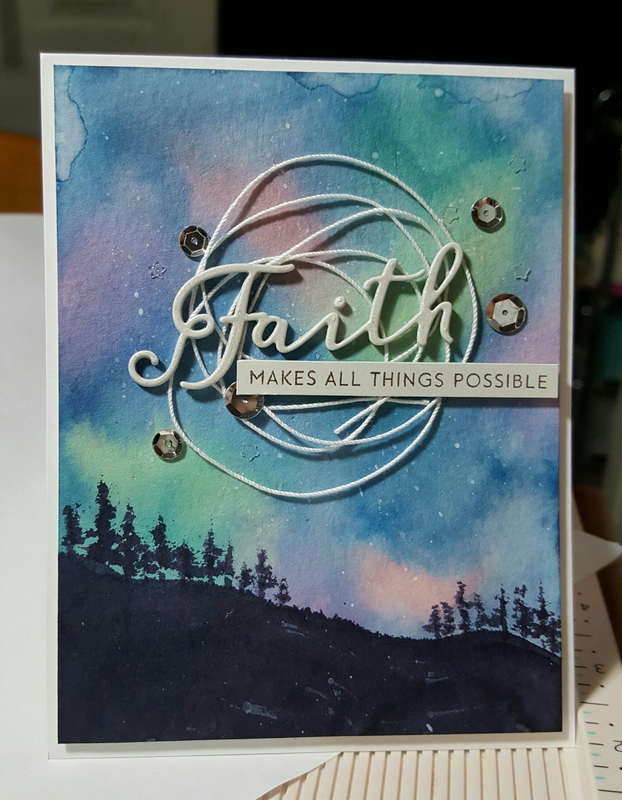 I am excited to try again with other colors, and am looking forward to trying get out the rest of the Stamp-a-Faire techniques! Definitely a few things I’d do differently on a remake, but I’m excited to have shared my first virtual Show and Tell Tuesday craft project! I’m hoping to make it a regular weekly post, but no promises on that just yet. My goal is to learn more about all of the extra options with blog posts to make them pretty with supply lists and better links. For now I’ll be satisfied with what I can do, with cards and posts!